pay for the privilege out of their own pockets and tour the place for fun. This harsh and forbidding (and some say haunted) place is now a tourist attraction. But for any lover of urban decay and horrific history, it’s a worthwhile tour. Architecturally, Eastern State an imposing hub-and-spoke building with cell blocks radiating out from a central administrative hub, wrapped in a high-walled fortress. But inside, it’s a peeling, damp, decaying ruin with many roped-off areas that are dangerously crumbling. Some cells with famous inmates have been restored somewhat (Al Capone’s cell, for example, has a nice desk and bedside lamp, albeit with ugly peeling walls), but most of them are in a pitiful state. The penitentiary closed in the early 1970s because of its poor state of maintenance and the huge cost of refurbishment, and even the tourist trade hasn’t injected enough cash into the system to do improve its condition. 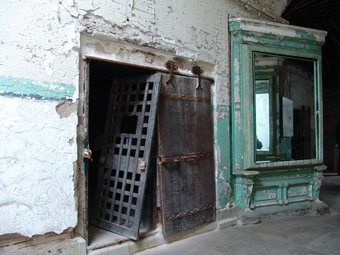 The Eastern State Penitentiary was built over the space of ten years, beginning in the early 1820s, and established on Quaker principles of repentance. Each cell was small, but had the relative luxury of running water and a latrine, along with a single skylight window called the Eye of God. Prisoners were to meditate on the errors of their ways and eventually pass back into society humbled and changed. Society with other prisoners was forbidden, to keep them away from the temptations of other corrupt souls. Besides, the goal of repentance can only be achieved personally, so a social life was irrelevant. But for all the good intentions of the prison fathers, the place became a hotbed of abuse almost immediately. The first prisoner, a burglar called Charles Williams with a two-year sentence, was admitted in 1829, more than five years before the building was completed. He was assigned a number, dressed in a prison uniform, disoriented by having a burlap bag stuck over his head, and was escorted to his cell. Other inmates followed, and were treated similarly. The bag treatment stayed in effect until 1903. They were kept in isolation in complete silence, without any reading material or distractions. Some lost their minds quickly, others acted out, and were swiftly punished for it. Troublesome prisoners were initially lashed with a leather strap. Repeat offenders were bound, strapped in chairs designed for restraining mental patients, and in some cases doused in water and left to freeze. The first investigations into prisoner abuse began two years before the prison construction was finished, and subsequent investigations turned up tiny unventilated isolation cells and even pits dug beneath the cell, in which especially troublesome inmates were “buried,” sometimes for weeks. Even the well-behaved patients suffered, though. Over the next 130 years, the prison underwent massive changes. The solitary confinement method was abandoned in the 1870s, and each cell’s individual exercise yard was converted into new cells. New cell blocks were added, along with a wood shop and other work and educational programs. But overcrowding soon took over. The structure was originally designed for just 250 prisoners, but after the modifications began, the population swelled to 1,700 in 1913. With overcrowding came neglect of the facilities, which began to crumble. By the 1960s, the place was so decayed that the cost of repair was more expensive than the cost of building new prisons, so in 1970, state Governor Shafer announced that four new prisons would be built to replace Eastern State. By the end of 1971, Eastern State had shipped out its last inmate. The place operated with a skeleton crew into 1972, and closed down for good. Except, that is, to paying customers. This historic site is open to the public on Wednesdays through Sundays, April through November, between 10 and 5. With no climate control and very little artificial light, it’s often an uncomfortable place to be, but then again, it was designed that way. 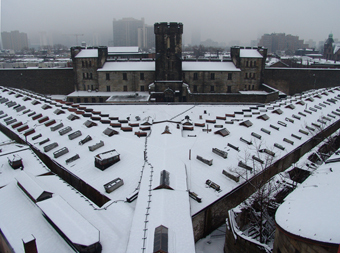 In Philadelphia there's an abandoned prison called Eastern State Penitentiary. The first part was built in the early 1800s, shutting down in 1970. Apparently at night ghostly orbs and lights appear. It was the first prison that had solitary confinement in the states, and executions were also held there. So you can imagine all the souls that may still be there. Tours are given to the public, but you have to wear hard hats. In high school my sociology teacher took us there on a field trip. I stepped in there and got the eeriest feeling. It looked like all the prisoners had just left. Cell doors were left standing open, and remnants of beds and chairs were left in some of the cells. The cell doorways looked like they were made for dwarves. You had to bend over to get inside. I felt like someone was going to walk out of one of the cells at any moment. We all huddled together, whispering. 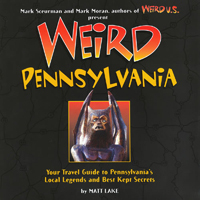 You can read more about Pennsylvania’s many other weirdly abandoned places in Weird Pennsylvania.